This section provides a tutorial example on how to view certificate details when visiting an 'https' Web site in IE 9. Your browser must validate the certificate to determine that the Web site can be trusted or not before doing any further communications. Your browser must use the public key in the certificate to help secure the communication messages sent and received. Normally, your browser will do these 2 tasks automatically without your interaction. You don't need to know where is the server certificate and what's in the certificate. But since I am interested to learn more about "https" communication, I want to see the server certificate. 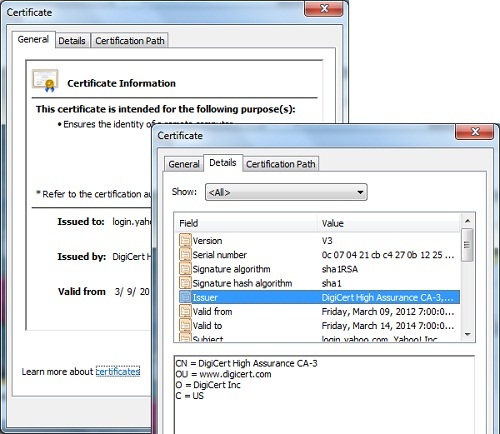 Here is what did on IE 9 to see details of the server certificate.